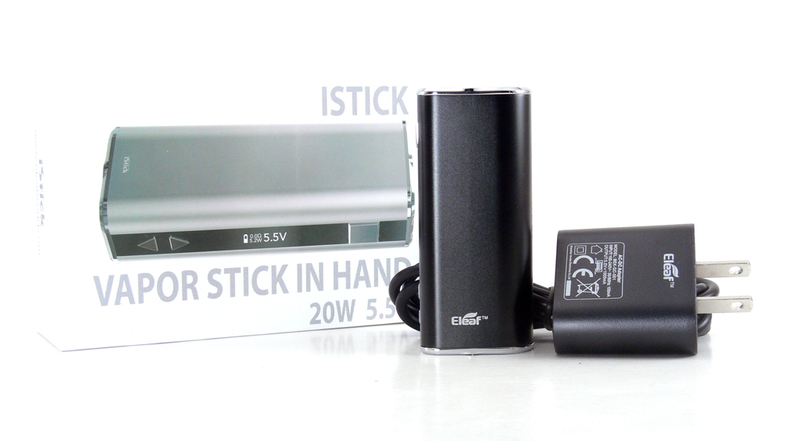 Eleaf iStick Review – A Diminutive VV/VW Box Mod! We may just have a winner in the perfect pocket device category. I recently picked up an iStick from Indy Vapor Shop after hearing some good things about it. The Eleaf iStick packs a decent amount of power as well as a nice display into a compact package. It’s not without a few faults, but it is a great little device. 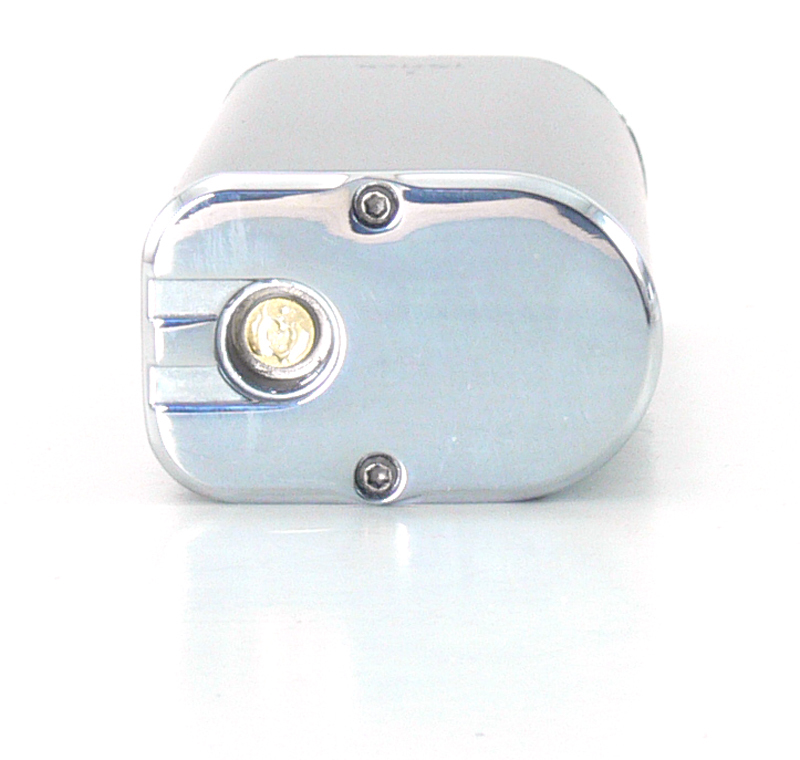 At 3.15 ounces, just under 3″ long and 1-1/4 inches at its widest, this is one tiny box mod. Three buttons and a screen are present on a flat side, while the other side is curved perfectly to fit in the hand. All the edges are nicely rounded, further improving the comfort in the hand or pocket. The top and bottom are flat, though, so it is also quite at home standing on a desk. The only odd thing about the design is the distance from the connector to the front edge. The width of the device is almost exactly 22mm, meaning that toppers such as a Nautilus or a Kayfun are flush with the edge. Unfortunately, the distance fro the 510 connector to the front edge is a little shorter, so 22mm toppers hang off the edge a little. It’s minor, but I can’t understand how the designers could have put this much effort into the clean look and missed that detail. Fit and finish of the iStick are much better than I would typically expect from a $40 device. My test model is black with chrome top and bottom and it is also available in red, blue and silver. The smooth matte finish seems like it will wear well and the metal body feels quite solid with no rattles or flexes. Three buttons are found on the side of the iStick, surrounded by a black plexiglass panel that blends in perfectly with the black finish. An LED screen showing the power settings, resistance and a graphical representation of remaining battery charge illuminates from behind that panel when buttons are pressed. Button function is about as intuitive as it gets. Two opposing triangles are used to raise or lower the output power by .1 watt or volt increments. Holding either button will start a continuous increase or decrease of .1 and pressing it again will cause it to change by .2 and then .5 increments. The larger fire button is in fact the only one that has multiple functions, three clicks change between voltage and wattage adjustment mode while 5 clicks turn the device on and off. A menu system is not needed, thanks to the comprehensive display. In variable wattage mode it displays the output wattage in a large font, with voltage and resistance displayed in a smaller one. In variable voltage mode, the voltage and wattage are swapped. Switching modes is really not that necessary as both values change when either one is increased or decreased. When firing the device, the display changes to a counter which shows the number of seconds that the button was pressed. The bottom of the iStick has a mini USB port that is used to charge the internal 2200mAh battery which is not user replaceable. It can be vaped while charging as well. 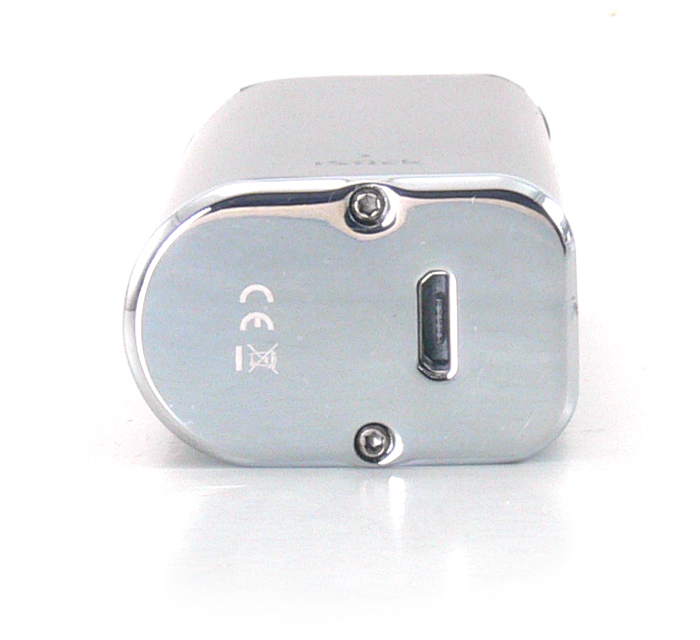 The top of the device has a nicely recessed 510 fitting with a fixed center pin. Two shallow grooves lead to the edge for airflow. An adapter for use with eGo style toppers is also included. The iStick has impressed me with it’s power output. I really wasn’t expecting this much performance from such an inexpensive and small device. The fact remains, though, that the 20 watt advertised power rating should have a big ol’ asterisk next to it. As mentioned before, the device has a 5.5 volt limit and that translates to there simply not being enough power output to reach anywhere near 20 watts with anything but a low resistance coil attached. With a 1.5 ohm atomizer attached I was able to reach the equivalent of 20 watts, but with anything higher than that the 5.5 watt limit was reached first. The other issue with the output is not a real big deal to me, but it is worth mentioning. The iStick uses pulse width modulation to regulate the output, something that most devices have now gotten away from. Why this matters is that the actual output is consistently higher than what is displayed on the screen. Set it at 10w with a 1.5ohm clearo attached, for instance, and it should send about 3.8v to the coil. That’s even what it will display on the screen. What it actually delivers, however is around 4.2v, which equates to almost 12w. Phil Busardo explains it in detail at around the 21:31 mark on his review if you’re interested and he looks at it as a major flaw in the device. I’m not nearly as put off by it, mainly because I set a device to what feels good rather than going by the numbers. It also probably has to do with the fact that some of my favorite vapes are 2 year old devices that also use PWM. I’ve been using this little guy for a couple of weeks now and I am pretty impressed with what it delivers considering the low price and small form factor. The performance has been great with just about anything I’ve tried with it as long as I stay below about 3 ohm resistance. Any higher than that and the 5.5 volt limit starts to hurt the output. The fixed center pin has been a little more of an issue. Some toppers just don’t make good contact, requiring the center pin to be pulled up slightly with a paperclip. If anyone in the industry is listening, we’d love to see adjustable center pins on all devices! Battery life has also been impressive. The battery life indicator is important if I’m going to throw just one device in my pocket when I head out the door. Every time I look at the gauge on the iStick it seems to be over 50%. I’ve gotten a couple of days of moderate use out of it with no problem. Decent power output in a small form factor for around 40 bucks. Enough said. My wife tells me that I can’t make a long story short, so I’ll say some more anyway. Ease of use, USB charging and solid design are bonus features on a device this size. The $40 price tag makes it easy to overlook flaws like the PWM power regulation and a couple of poor design decisions. They’re things I can live with and that is really what the iStick comes down to – it’s an inexpensive device that is easy to live with. I bought the iStick for this review from Indy Vapor Shop, which sells the kit including charging cable and wall adapter for $42.95. 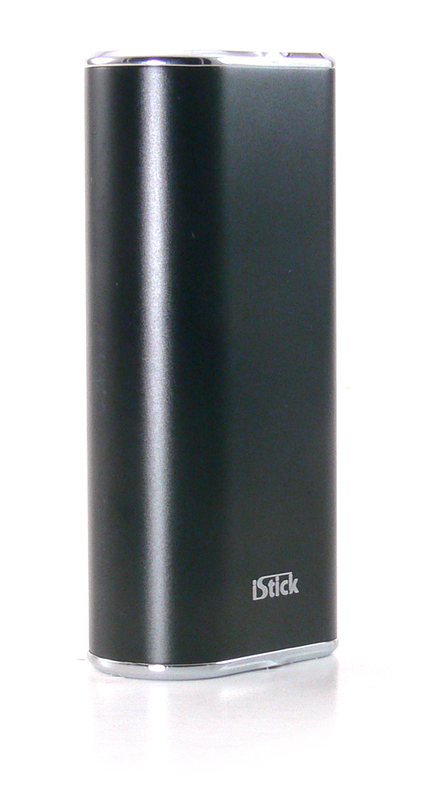 The iStick alone is available for as little as $35.95 from Litecig.